Talking Calculator with alarm clock is pocket sized. 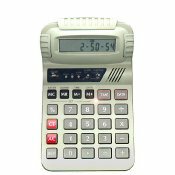 Slim line, this 8 digit calculator features LCD and audio entries and results, 4 basic math functions, 4 memory functions and a percent operation, adjustable volume and alarm clock. 2 AAA batteries. 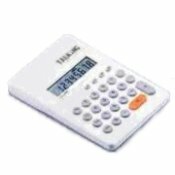 Talking 10 digit Calculator has easy-to-read display, voice announcements, talking alarm, 15 music pieces. It announces entry numbers and calculation results, lets you set units or digits for results, simplifies percent and tax calculations, repeats entries, announces time and date and plays 16 music box melodies. Volume is adjustable. 2 AAA batteries.